Make a Vodka Gel-O-Shot INSIDE A SEALED Banana! I'll show you how to use Osmotic Pressure to gel the inside of a banana. This also works as a great magic trick for your next party. The banana needs to be almost ripe in order for the skin to become semipermeable enough to allow the Vodka (ethanol) to pass through it via Osmotic Pressure. Ethanol is a great solvent for biological molecules. The sugar will encourage coagulation of the liquefied banana interior. Refer to step 4 for a detailed scientific explanation. Add Vodka to the banana in the plastic container. Fill it up the entire banana is covered. Pour in the sugar and mix it until it dissolves completely. Step 3: Cool Your Jets! Put the whole thing in the refrigerator for a few hours, uncovered. It will take anywhere from 4 to 12 hours, depending on the quality of the Vodka, amount of sugar, and the temperature of your fridge. You'll have to try it a couple of times to get it right. If the banana is only partially gelled, leave it in for a couple more hours next time. Don't leave it in there for too long, though. It will turn into a runny mess! So what's going on inside that banana? In this experiment we have both water (H2O) and Vodka (ethanol). Because the peel of the banana is a semi permeable membrane, it allows the ethanol to pass through it. This is caused by the difference in the concentrations of salts inside and outside the peel. High concentration of potassium and other salts inside the banana and the low concentration of salts outside the banana will encourage the ethanol to pass through the peel into the banana to equilibrate the system. According to an article in Experimental Botony, 1980, volume 31, number 4, pages 975-982, the banana pulp will begin to leech electrolytes. The high concentration of potassium inside the banana will drop. This will also help the system come to equilibrium. The coagulation of the inside of the banana is readily dependent on the temperature of the system. Ethanol is a great solvent for biological molecules. It will dissolve some of the inside of the banana, but at the same time all the lipids will not go into solution. So it is no surprise that the ethanol makes the banana become 'softer.' It is essentially liquefying the inside. In the process, the transition temperature inside the banana has raised above the temperature in the refrigerator. Dropping the temperature will cause the lipids and the ethanol solution to congeal. Hence the 'gel-o-shot' like state. Take it out of the fridge and check the firmness. You should notice right away that the banana feels very gelatinous inside. If it's not, then the alcohol hasn't had enough time to pass through the banana membrane and begin to liquefy the inside. The banana will also have browned quite a bit from the cold spell. That is normal and will happen to a plain banana as well. In this experiment, the browning is accelerated by the leeching of electrolytes. Use a knife to cut a notch right at the base of the stem, then peel it open to reveal your tasty alcoholic treat! How long does it stay like that in ambient temperature? Or does it need to be eaten right away? I see in the photo you poured the vodka into the sink, are you able to pour it back into the bottle and keep using it for other drinks, rather than just pouring it away? 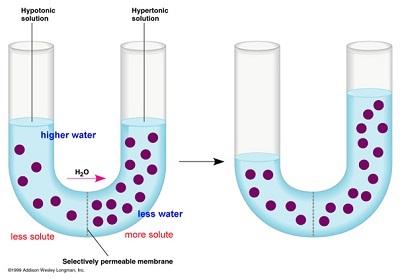 osmosis is diffusion with water. i think the correct term you are looking for is diffusion. if i remember correctly, this thing is not an osmotic pressure system. it is just normal osmosis. osmosis works by allowing ions to travel from an area of high concentration to travel to a area of low concentration to cause equilibrium. equilibrium is the "balancing" of the ions on both sides of the membrane (in this case the banana peel) im not sure of the EXACT science of what permeates the membrane in this expirament but im sure it is diffusion. osmotic pressure uses pressure to force ions from a lower concentration to a higher concentration diluting the higher concentration thus achieving equilibrium. hmm, I always thought that osmosis involved liquids and diffusion was gases only? That's odd. It could have been the cheaper Vodka. What proof was it? The higher the proof, the more ethanol content, which is what you need for this to work correctly. so if u just want a gelled banana, u could use pure alcohol. just dont eat it. One too many it seems. Interesting refrigerator contents; water, beer and banana shooter. Not a lot of nutritious clutter in the way, I like it! Got to admit the banana does look rather gross afterwards. Wash well the banana.... it can be full of Herbicide.